Walter John Smith was came to Chelmsford shortly before the war with his wife and elder son. He had worked as a stableman and coachman, and when he came to Chelmsford he was a greengrocer and then a coal merchant. A second son followed before Walter joined the army, landing in France in September 1915. He died from wounds in May 1918. His home was in Chelmer Place, off Springfield Road. 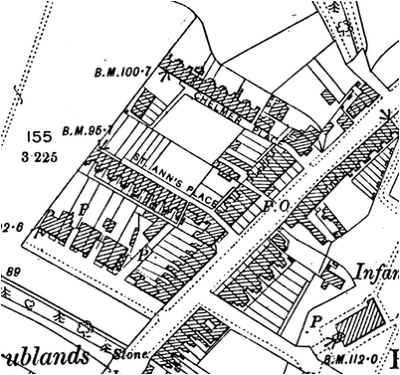 The 1891 census found Walter, aged six, living with his parents and six siblings at 11 The Terrace, Church Street in Witham. His father was a railway labourer. At the time of the 1901 census Walter, aged 16 was living with his widowed uncle, William Poulter, his own sister Florence Smith and two visitors at 35 Lower Market in Hove, Sussex. Walter and his uncle were both stablemen. His parents were still resident in Witham. Walter married Suffolk-born Amelia Clarke in Norfolk in 1908. 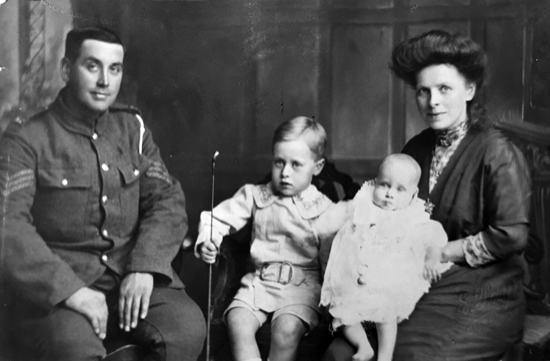 The couple had two sons, the elder being Walter John Smith, born in Pimlico, London in 1911 and the younger being George Bertram Smith (1915-1990) in 9th September 1915. The family is pictured left. The census of 1911 found Walter, his wife and son living at 2 Witton Mews, Grosvenor Place in London. Walter was employed at the time as a coachman. Meanwhile his parents were living at the Oddfellows Arms in Springfield Road, Chelmsford (later given the number 195) where his father had held the licence since December 1909. Perhaps attracted by the fact that his father was already in Chelmsford Walter arrived in the town by April 1915 when he was working as a greengrocer and living in Chelmer Place, a cul-de-sac that led off Springfield Road adjacent to his father’s pub. Walter also worked as a coal merchant before enlisting into the army at Woolwich and served with the Army Veterinary Corps. He laded in France on 9th September 1915. He died from wounds on 29th May 1918 while serving as Serjeant SE/9512 in the Army Veternary Corps, attached to the 94th Brigade, Royal Field Artillery. He was aged 33. He is buried at Coulommiers Communal Cemetery, Seine-et-Marne in France (grave: B. 9). Walter is commemorated on the Civic Centre Memorial, and on the Springfield Parish Memorial at All Saints’ Church. He was entitled to the 1914-15 Star, British War Medal, and Victory Medal. The 1918 register of electors listed an absent Walter John Smith, and his widow at 1 Chelmer Place in Springfield. His father left the Oddfellows Arms for the Rose and Crown in Rainsford Road, Chelmsford in 1916. Walter’s nephew, Bertie Walter Smith, was killed during the Second World War. Walter was born at Witham in 1885, the son of John Smith and Ellen Smith (nee Poulter). His father had been born c1852 in Wethersfield or Blackmore; his mother c1855 in Wethersfield. They had married at St. Mary Magdalene’s Church in Wethersfield on Christmas Eve 1874 - at that time Walter’s father was a 21 year-old labourer, and his mother was two years his junior. Both lived in Wethersfield. In 1881 the couple had been resident at 11 Chipping Hill Terrace,Witham. Alfred Smith (born c1887) and Ellen A. Smith (born c1889). All were born at Witham except Edith who was born at Landchester in County Durham.